VISALIA – The County of Tulare closed escrow on the sale of the old County Courthouse building on Aug. 1 to a group of local investors who plan to transform the building into a boutique hotel. Courthouse Square Ventures, LLC plans to renovate the building into a 34-bed hotel. The hotel will feature a rooftop lounge, outdoor pool, gym, and conference room space. The exterior of the former Tulare County Courthouse Annex will be refreshed and repaired, as well as its art deco era details restored. A rooftop lounge, no longer a pool, will be added with the old mechanical room converted into the hotel’s small interior lounge with a bar, which will service two large exterior, open lounge areas with a maximum capacity of approximately 160 guests. The north and south lawn areas will be transformed into a patio garden and pool courtyard, respectively. Due to the nature of the historic building, the renovation presents a number of challenges and limitations, which will likely create a certain level of quirkiness and uniqueness to the finished project. 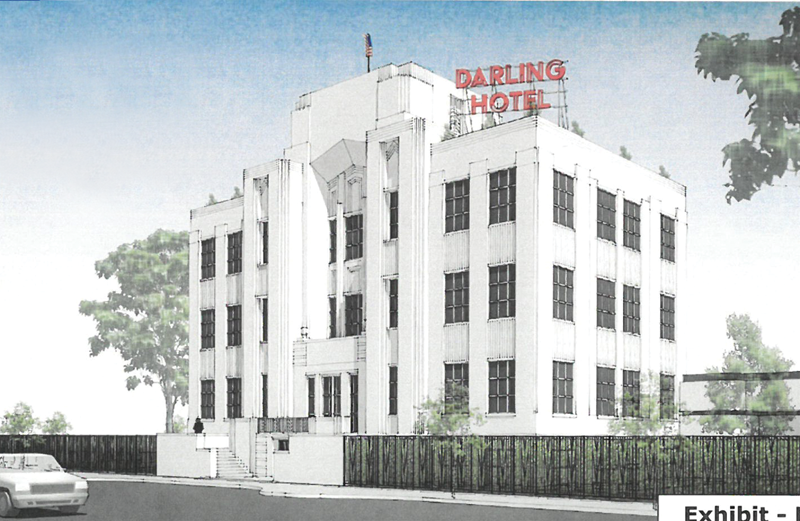 Matt Ainley, the project lead, said construction on The Darling will begin this month with plans to open by early 2020. It will be named The Darling, a tasteful nod to its era, as well as a subtle reference to the project lead’s late birth mother, Darlene. Last October, the County requested proposals for redevelopment of the building located in downtown Visalia that has remained vacant since 2008, when county staff relocated offices. In December, the County approved the proposal by Courthouse Square Ventures. The sale also includes the purchase of the current Tulare County Probation Department office adjacent to the hotel. Tulare County Probation will continue to occupy the building while it transitions to another location. Once the building is empty, it will either be redeveloped as a second phase of the hotel or used for a separate purpose.